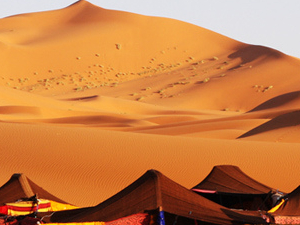 - Dinners In Drra Valley,merzouga,dades Velly. You will be welcomed by your English speaking driver in the airport of Mohamed 5 in Casablanca. 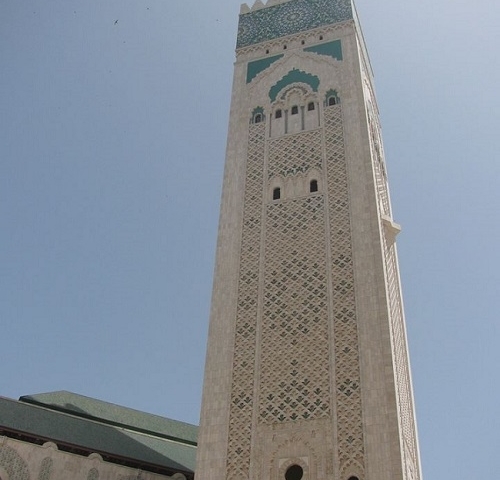 If there is enough time you will head to the city to visit the most highlighted landmark in Casablanca, the Hassan 2 mosque. The work to build this mosque began in 1980 .its built right next to the Atlantic Ocean .the entire structure, which covers a total area of 24,000square, is designed on a gigantic scale. the prayer hall accommodates 25,000 worshippers ,with space for a further 80,00 pilgrims to pray on the esplanade .a cultural center ,with a library ,museum and Koranic school ,adjoins the main building .and after the visit of this vast construction you will drive to the Corniche which is bordered by uninterrupted sweep of beaches ,swimming pools, cafes ,hotels and restaurant .and after that you will drive straight to Marrakech .over night in a Riad in the old medina. At 9:30 AM, your local guide will come to your riad and start the tour of Marrakech.the old medina is the most interesting thing to see, so you will start with the Bahia palace .you will enjoy seeing the fountains inside and the courtyards, planted with flowers, were reserved for the sultan’s four wives and twenty –four concubines. And then, you go to see the Bab Agnaou.it is one of the oldest and most impressive of the entrance to the Kasbah. Its name comes from the two towers that one stood on either side of the gate and formed an offset entrance designed to foil attackers. And just as you go through the same gate it’s the Kasbah where the Saadian tombs are .and after that you will go to famous square of Jama El Fnna .it’s a place for story-tellers and many performers .also from the square you can see the Koutoubia mosque, a masterpiece of Hispano-Moresque art. You will enjoy as well its pink stone walls which are decorated with festooned arches, painted floral motifs and carved tracery. Later on you will go the main souk. Ideally placed on the Saharan trade routes ,Marrakech was a convenient staging post for caravans and soon developed into a major craft and trading center .and after that ,you will go to the Ben Yossef Mederasa ,its architecture and the subtle use of decoration ,achieved through a balanced combination of stucco and mosaic ,marble and cedar wood ,were influenced by the styles of Moorish Spain .and of course will be in a local restaurant which serve Moroccan food like tajins ,couscous and mint tea and the last place the visit include is the Majorelle Garden this delightful gardens ,planted not only with bougainvillea ,coconut palms and banana trees ,but also with bamboo and palm trees. and after the garden you will take a quick visit to the new city then ,get it back to the Riad. Overnight in the same Riad. • Day 3: a day trip to Essaouira and back to Marrakech. This day is delighted to a day trip to Essaouira .from Marrakech its 108.6 miles one way. on the way you will drive through Chichawa and the Argan forests .the Argan tree ,indigenous to morocco, grows in arid ,misty regions .it is most commonly seen, either cultivated or growing wild ,in light forests in the Essaouira region ,the eastern foothills of the high atlas and the foothills of the anti atlas. In this light forest you will stop to see goats up the Argan trees also you will have another stop to see an Argan cooperative to how the Agran nuts processed to take out the oil. 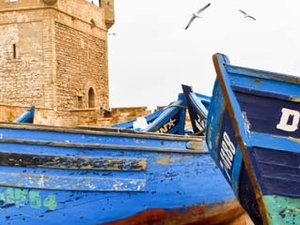 And around 10:30 AM you will arrive Essaouira .this town stands on a peninsula that is permanently swept by the trade wind. From behind the ramparts ,the blue and white town of Essaouira ,ancient Mogador ,seem to defy the ocean .there are many art galleries tucked away in this fortified town .so you will see the port and the ramparts also the medina .from the place Moulay el Hassan ,in which Moroccan and Portuguese architectural styles are combined ,narrow shopping streets run past the clock tower and the great mosque and into the square of the Bab El Sebaa.you can as well visit the Mellah and the Galerie Damgaard. Also the beach of Essaouira which is known with surfing deserves a walk. and around 4:00 pm you will drive back to Marrakech. overnight in the Riad. 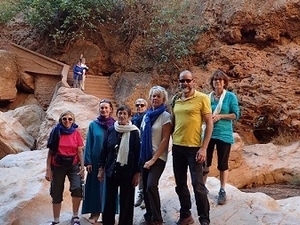 • Day 4: Marrakech to the great south via TIZI n Tichka, Aitbenhaddou, Ourzazt ,Drra valley. 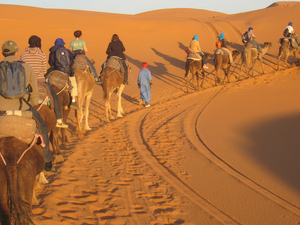 In the morning at 8:00 am, you will start the tripe towards the central south east of morocco. first ,you will drive through the high atlas mountain and pass through various villages that are typical of the northern slopes of the high atlas where corn can be seen ripening in the sun on the packed earth roofs of the stone houses. the road continues across the territory of the powerful Glaoua tribe where a number on ancient Kasabh and fortified granaries can be seen .in this point you will stop to visit the dar Glaoui,the great kasabh of Telouet ,surrounded by high ,crenellated walls and flanked by square bastions ,overlooks the Oued Imare .buit in the 19th century ,it was to serve as the residence of Thami el Glaoui.and after that continue the visit the fortified village of Ait Benhaddou .its movie site where many films were shot like gladiator and others. This UNSCO site is a place for walk so you will hike like 40 mins inside its narrow streets. lunch in local restaurant in Ait benhaddou .after lunch you will drive to Ourzazat and stop to have a sightseeing to one of the cinema studios and to the kasabh of Taourirt .then drive through the line of Jebel Tiffernine on the eastern foothills of the Anti atlas .it minds the mountain to Tizi N Tinififft (5,450 feet) and then descends rapidly to Agdz ,the tiny administrative center situated at the foot of the rock face of the jebel Kissane.over night somewhere in Drra valley in a hotel. 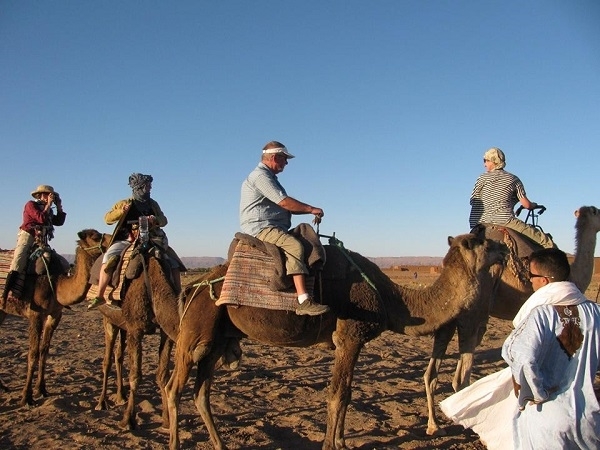 • Day 5: Drra valley to Merzouga via Nkob and Rissani. 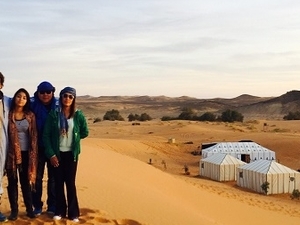 In the morning at 8:30 Am you will continue the trip to Merzouga. first ,you will follow the Oued Drra ,with palm groves laid out along the banks and dotted with about fifty Kasbah and Ksour ,many of which are worth a visit .In ancient times the Drra was a permanent river ,the longest in Morocco. Today it rises near Ourzazat and travels for 156 miles before disappearing into the sand .but you will not drive all the way down the valley but you will turn over to Nkob .this small town which was the capital of the confederation of Ait Atta , has a beautiful palm grove and a fortified village too. lunch in a local restaurant .after lunch ,you will continue the journey to Rissani. you will see the Mausoleum of Moulay Ali Cherif ,father of Moulay el Rachid and founder of the Alaouite dynasty .it was rebuilt in 1955 sfter suffering devastating damage when the Oued Ziz burst its banks .also you will visit the ruins of the Ksar Abbra .the abandoned fortress was built in the early 19th century as a residence for the members of the royal family. also you will see the surviving ruins only hint at what Sijilmassa, the first Muslim city in north Africa and the prestigious capital of the Tafilatet, must have a look .and an important staging post on the trans-Saraharan caravan route, trading in gold, slaves and salt .after a sightseeing to this old town you will drive straight to the golden sand dunes of Merzouga to spend the night in the middle of the desert with camels. Overnight in a Berber tent. 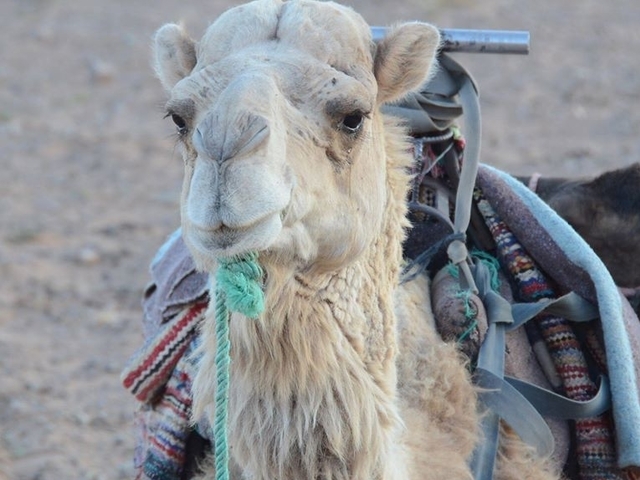 • Day 6: Merzouga to the Dades valley via Tinjdad and Todgha gorge. 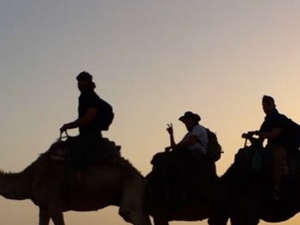 Early in the morning you will get up 20 Mins before the sunrise to enjoy the best sunrise in the desert .then you will ride back the camels back to the hotel for breakfast and shower. And when you are ready you will continue the trip through Rissani .from here you will drive in a different road to Erfoud which is know with Fossils .About 10 miles south are the Goniatite Quarries ,where a black marble containing goniatite fossils is quarried. So you will have a chance to see as well as place where they make different kinds of tables ,sinks out of this fossils .than continue the trip towards Tinghir .This former military outpost is a large village of three thousand inhabitants ,rising in terraces around a hillock covered with a dense and extensive palm grove .and in this town you will drive up the mountain like 7 miles to see the Todgha gorge .lunch in a local restaurant .then continue the trip to the Dades valley .over night after the bridge of Ait Aoudinar and Ait Ouffi ,the most impressive section of the gorge begins. 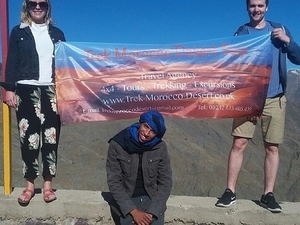 • Day 7: the Dades valley to Marrakech via Skoura and the high atlas. 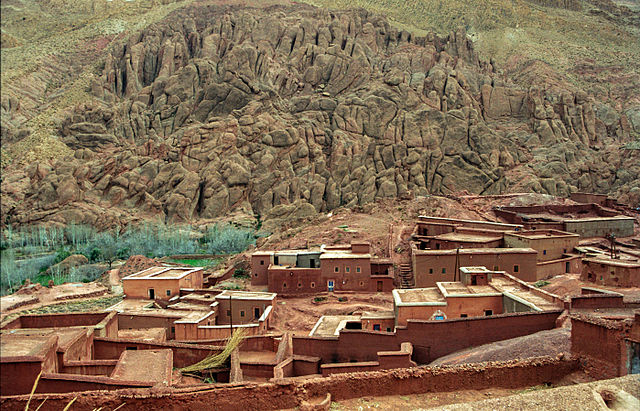 at 8:30 am in the morning you will travel to see the brown pise kabahs in a verdant valley bathed with the winding clear waters of the Dades ;the rich ocher of the rocky desert contrasting with mountains tinged with pastel hues of fruit trees in blossom. And after this valley which called as well the valley of one thousand kasabhs ,you will see the rose valley. 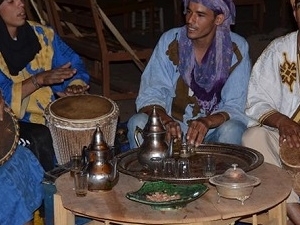 a festival of roses in held in Elkelaa Mgouna in May .to celebrate the new harvest the two hundred workers employed in the rose water distilleries .after the rose valley ,you will drive to the fortified residence of Amerhidil .once belonged to the most powerful family responsible for protecting the village and its land. you will enjoy as well the dense palm groves are crossed by a network of tracks running between Kasbahs ,Ksour and crops. Then drive straight back to Marrakech and lunch will be in a Berber village somewhere in the high atlas mountain.Drop off in Marrakech. > For groups the price is going to be down. We require a standard 20% deposit of the total tour cost to guarantee your tour, accommodations, vehicle, and driver/guide. We will confirm your booking with an email. The remaining amount will be invoiced on your arrival at our travel agency. You will receive an email indicating the various advance payment options, whether from Europe or Morocco.